Post contributed by Andreas Johnsson, Department of Earth Sciences, University of Gothenburg, Sweden. 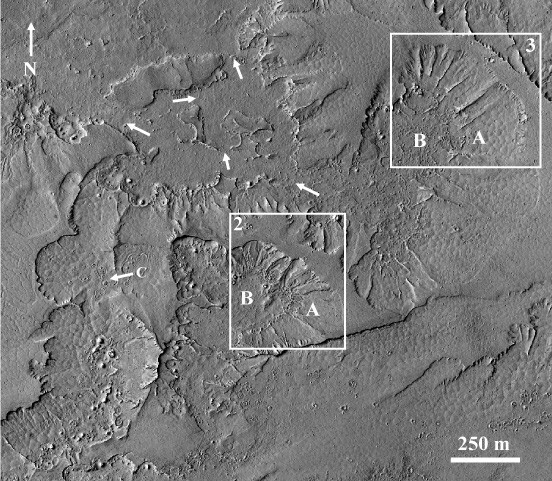 Small-scale lobes on Mars (Fig. 1) are tens to hundreds of meters wide and consist of an arcuate frontal riser that is a meter to meters in height and a tread surface (Johnsson et al., 2012) (Fig. 2). The riser is often, but not always, outlined by clasts visible at HiRISE resolution (50-25 cm/pixel; McEwen et al., 2007). 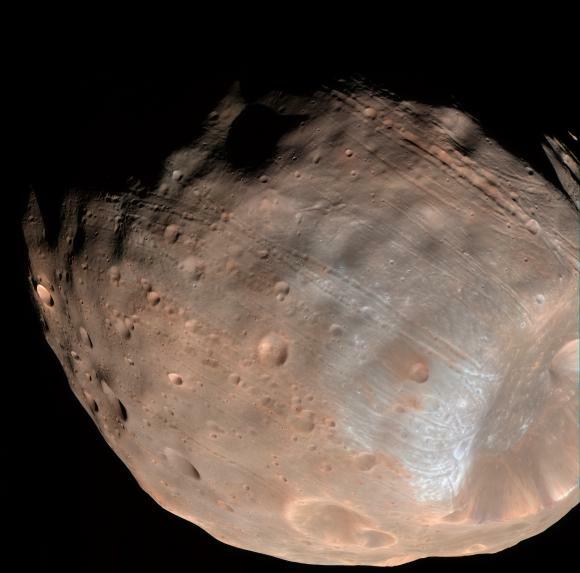 They are found on crater slopes in the martian middle and high latitudes in both hemispheres (e.g., Gallagher et al., 2011; Johnsson et al., 2012; 2017) . Figure 1. Subset of HiRISE image PSP_008141_2440 (lat: 63.78°N/long: 292.32°E) showing multiple clast-banked lobes in an unnamed 16-km diameter crater (white arrow). Note the degraded gully system (black arrows) and lobes inside the alcove area. Post contributed by Alex Barrett, Dept. of Physical Sciences, Open University, UK. 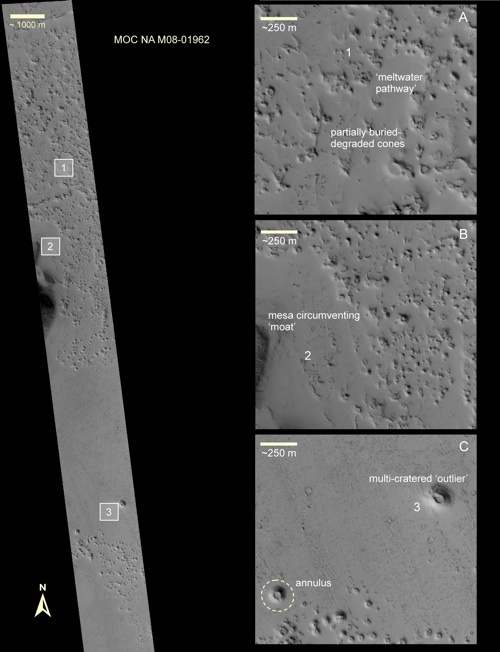 The following images show the walls of a two kilometre diameter impact crater in Utopia Planitia on Mars. This region is part of the low lying Northern Plains which have generally flat topography. The main occurrences of steeper hill slopes in this region are impact craters such as the one illustrated below. Image 1: This image shows the southern wall of a two kilometre diameter impact crater in Eastern Utopia Planitia. Note that the image has been rotated so that down-slope is towards the bottom of the image. Several rows of lobate structures can be seen on the right hand side of the image. These may be analogous to the solifluction lobes found in periglacial environments on Earth. To the left hand side of the image are several thin lines of metre scale clasts which could possibly be sorted stripes. Closed-system (hydrostatic) pingos (CSPs) are perenially ice-cored (non-glacial) mounds formed primarily by the near-surface injection of pore water. Their shape ranges from circular and sub-circular to elongate and their size varies from a few to hundreds of metres in diameter. Some of them reach tens of metres in height (see Figs. 1a,b). 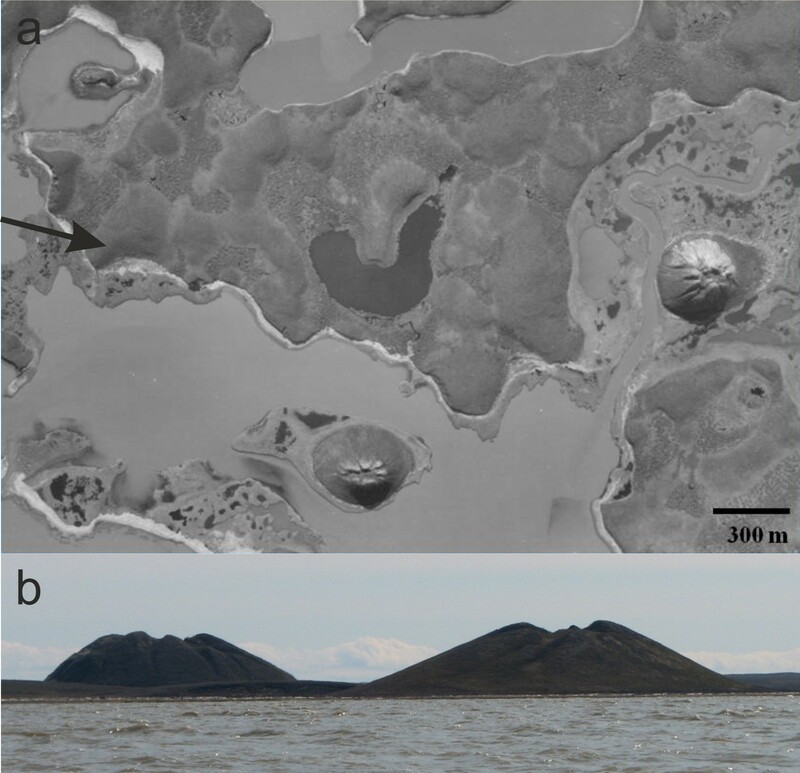 Image 1 Plan view of a thermokarst lake/closed-system pingo assemblage that lies 6 km sw of Tuktoyaktuk on the coast of the Beaufort Sea in northern Canada (690,26’,34” N, 1330,01’,52” W). Ibyuk Pingo, at the right, is ~48 m high; Split Pingo, at the centre, is ~38 m high. Both pingos display irregular cavities at their summits. These are markers of mound degradation. Image A27917- 35-1993, courtesy of the National Air Photo Library, Ottawa, all rights reserved. Arrow indicates approximate viewing direction of part b. b. Ground view of Split Pingo (at the right) and Ibyuk Pingo (at the left) from the Beaufort Sea. Note the slope-side cracks that radiate from the summit cavities. They too are markers of mound degradation. Image, courtesy of R. Soare. On Earth, periglacial regions underlined by continuous and ice-rich permafrost are found in areas of Northern Canada and Siberia These areas are very sensitive to abrupt climate-changes (Murton, 2001). The ice-rich permafrost has a unique assemblage of landforms, some of which are signatures of climate change (Image 1). 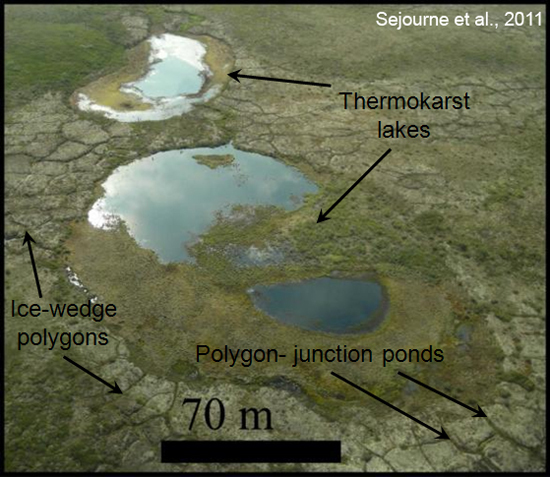 On Earth one example are the thermokarst lakes that have resulted from extensive thawing of permafrost following global warming during the Holocene (Czudek and Demek, 1970). Freeze-thaw cycles of the permafrost produce ice-wedge polygons (Washburn, 1973). Localized melting of ice-wedges at the junction of the polygons induces the formation of small ponds of surface water (Washburn, 1973). Post by Dr. Colman Gallagher. Mars’s Athabasca Vallis is a 10 km wide, 300 km long channel carved by floods originating in the Cerberus Fossae. Recent images acquired by the HiRISE instrument aboard the Mars Reconnaissance Orbiter provides strong evidence that the head reaches of Athabasca Vallis experienced repeated cycles of freezing, with the development of ground ice and polygonised terrain, and warming, marked by ground ice thaw. Image 1: Retrogressive thaw slumps (RTSs) on the inclined margins (examples marked A) of thermokarst depressions (examples marked B). RTSs have steep, shallow headwalls fronted by inclined flow slumps. Thaw consolidation and ground lowering precedes retrogressive backwearing of the headwall (Czudek and Demek, 1970). RTS headwalls are often facetted due to retrogression exploiting exposed, thawing ice wedges spatially arranged in polygons. Thaw fluids transported through gullies and channels on the slump, from melting ground ice exposed in the headwall, are stored in the depressions fronting the RTSs. However, depressions frequently merge by the retrogressive erosion of inter-depressions. When this occurs, fluid in the higher depression may be tapped into the lower through breaches (examples arrowed), exposing the floor of the drained depression. So, as the depressions fronting these RTSs filled and later drained by tapping, residual taliks froze, epigenetic polygons formed on the exposed floor due to ice segregation and heave and pingos formed by the intrusion of pressurised liquid water into the frozen surface and/or by the freezing of enclosed taliks (e.g. at point of arrow marked C). The resulting “alas” form is a basin with an undulating floor pierced by conical pingo mounds and enclosed by gentle polygonised slopes. White boxes are approximate footprints of Images 2 and 3. All Mars images are sub-scenes from HiRISE image PSP_007843_1905. Image credit NASA/JPL/UofA. Cone fields of the Tartarus Colles of Mars (~190° W, 26° N) comprise part of the volcanic province of the Elysium Rise. They lie amongst the mesas, ridges, small knobs and hills from which the region derives its name. 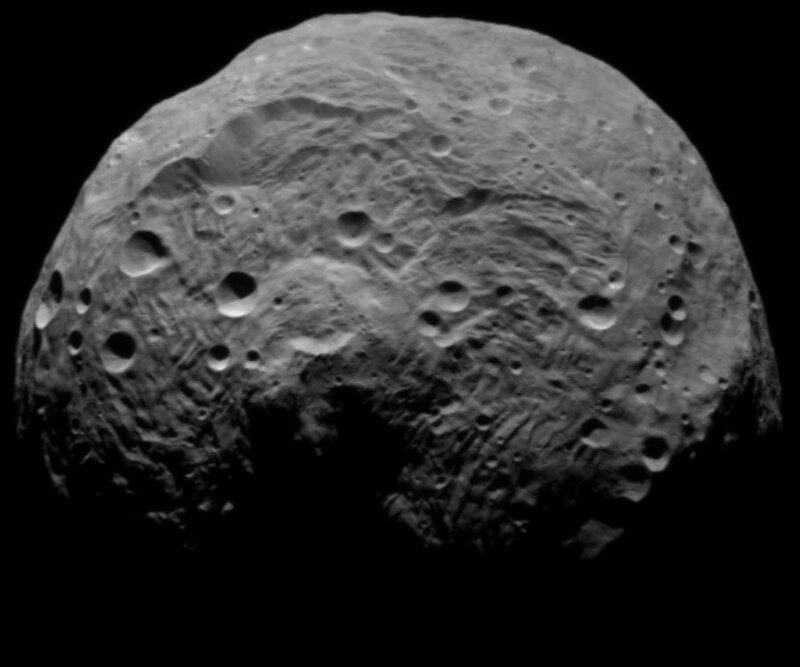 Considerable interest exists in regard to cone location and origin, as their occurrence may be associated with recent volcanism, as well as the occurrence of near surface ground ice; the presence of which has consequences for past and present climate, astrobiological activity, and future exploration. 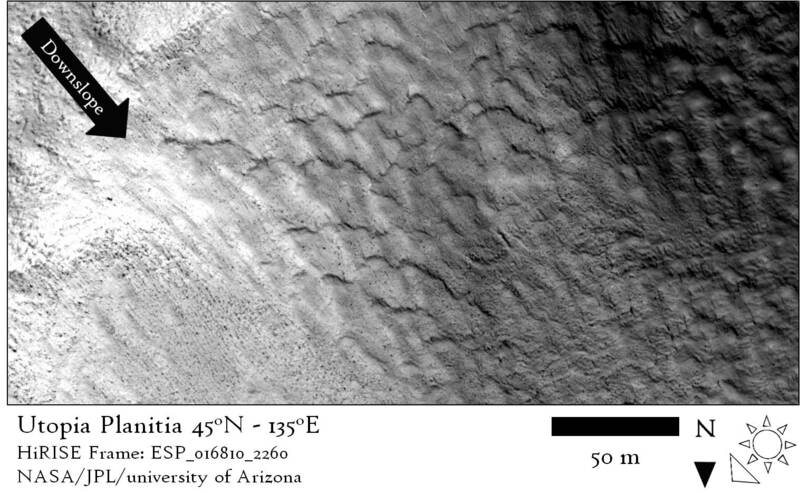 Image 1: MOC NA image M08-01962 (4.52 m/pixel) showing the cone fields and enlarged insets of geomorphic features. 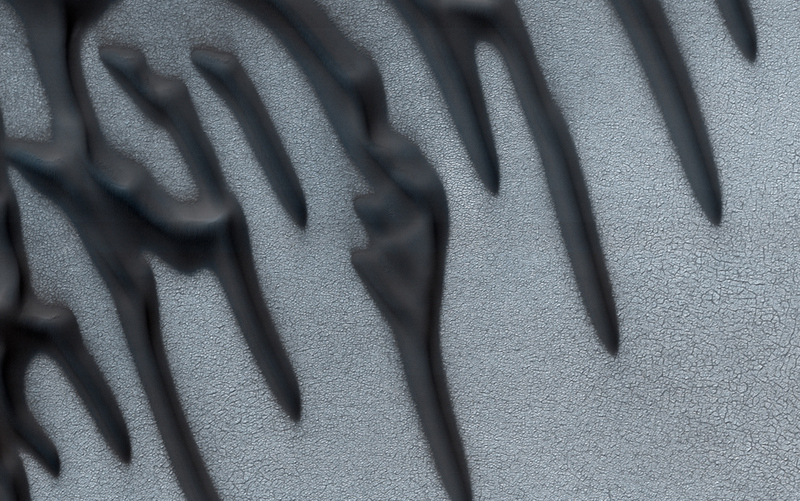 Geomorphic details are highlighted and numbered (1-3). Illumination is from the left.